Christie’s Dubai sales of Modern and Contemporary Arab, Iranian and Turkish art raised a total of $8,528,300 on the 29th and 30th of October 2013. This was 10% below the low estimate of $9,492,000 – $13,133,500. However, the result was the highest for Christie’s Dubai since Autumn 2010 ($11.6m), and up 68% on Spring 2013 ($5.2m) and 78% on the previous Autumn season ($4.8m). 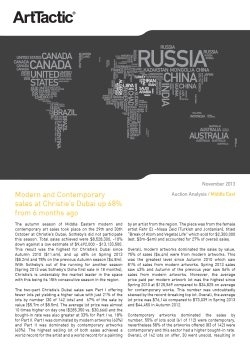 With Sotheby’s out of the running for another season (Spring 2013 was Sotheby’s Doha first sale in 18 months), Christie’s is undeniably the market leader in the space with this being its 15th consecutive season in the region. Subscribe now and get access to the full report and market analytics.